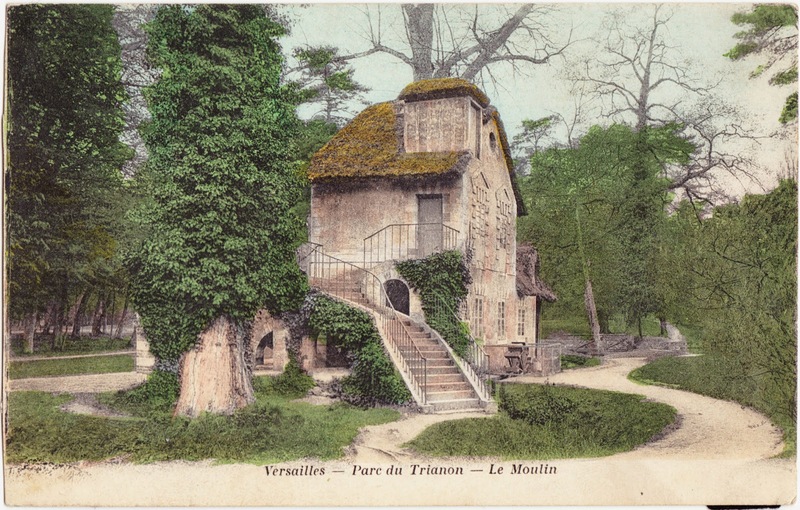 This undated French postcard shows the exterior of The Mill (Le Moulin), one of the many buildings and cottages located with Marie Antoinette’s Hamlet (Hameau de la Reine) on the sprawling grounds of the Palace of Versailles. 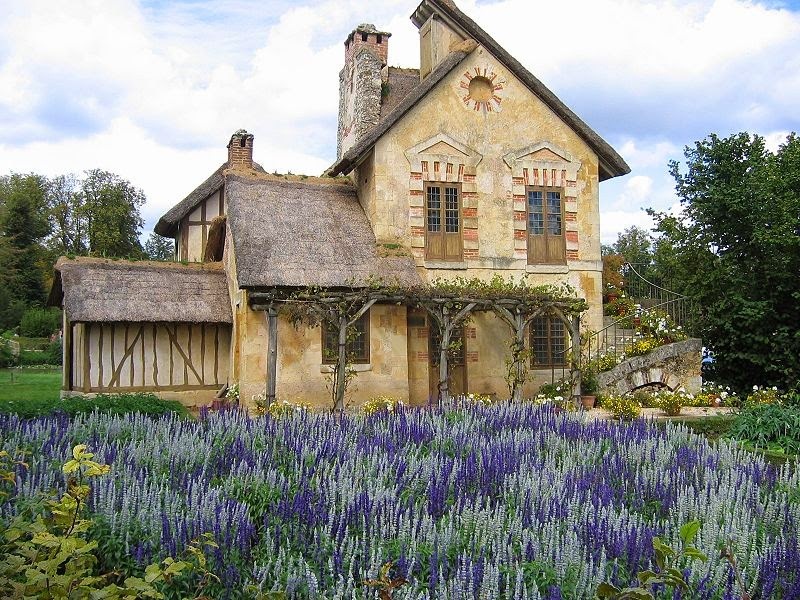 The hamlet was built for Louis XVI's famous spouse in 1783 — ten years before her beheading. "It served as a private meeting place for the Queen and her closest friends, a place of leisure. .. [I]t contained a meadowland with lakes and streams, a classical Temple of Love on an island with fragrant shrubs and flowers, an octagonal belvedere, with a neighbouring grotto and cascade. There are also various buildings in a rustic or vernacular style, inspired by Norman or Flemish design, situated around an irregular pond fed by a stream that turned the mill wheel. The building scheme included a farmhouse, (the farm was to produce milk and eggs for the queen), a dairy, a dovecote, a boudoir, a barn that was burned down during the French Revolution, a mill and a tower in the form of a lighthouse. Each building is decorated with a garden, an orchard or a flower garden. The largest and most famous of these houses is the 'Queen's House' that is connected to the Billiard house by a wooden gallery, at the center of the village. A working farm was close to the idyllic, fantasy-like setting of the Queen’s Hamlet." 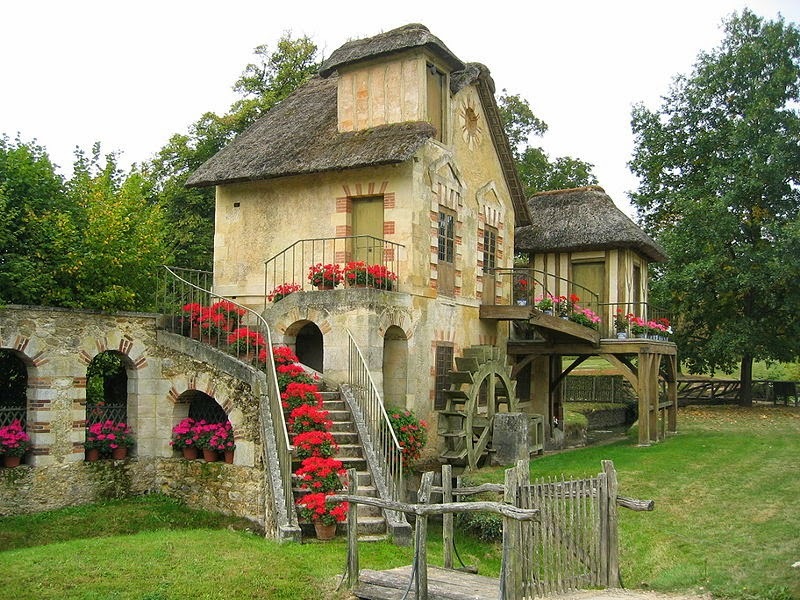 So, in the grand scheme of things, The Mill was only a minor part of Antoinette’s fantasy retreat. Clearly, no expense was spared on Hameau de la Reine. One source cites the 18th century construction cost at 500,000 livre. Another source indicates that 500,000 livre would be the equivalent of about $5 million in modern dollars, but that seems a little low to me. "The Mill, built and fitted from 1783 to 1788, was never used for grinding grain, contrary to what is often argued. The wheel is driven by a stream derived from the Grand Lake and is only a decorative element. No mechanism or wheel were installed in the factory. The interior decoration was simple and neat. This structure is one of the most picturesque of the Hamlet. Each façade of the building is decorated slightly differently. This mill also served as a laundry." In a way, this lavish retreat helped to stir the flames of the French Revolution. To escape the "stresses" and responsibilities of her real life, Antoinette enjoyed running off to her elaborate playground, where she would dress like a young peasant, don a straw hat and milk cows (all while still accompanied by the greatest royal comforts and attendants; indeed, the milk from the cows flowed into buckets made of Sèvres porcelain). The whole scene was perceived as an extravagant mockery of the real struggling French peasants, and served to both further erode Antoinette's public image and grow the anger and resentment toward the monarchy. This postcard shows what The Mill looked like roughly 100 years ago, which would be about 130 years after its 18th century construction and long after Antoinette's head was separated from its body. This is what The Mill looks like today. It has been restored and is open to the public, though there is an admission fee. Straw hat not included.